A wrought iron stair railing is a beautiful upgrade that can truly take a staircase to the next level. This week, we showcase a classic custom residential project: a simple yet elegant ornamental metal system. With clean lines and a geometrical twist, this railing is the perfect accent for this southeastern residence. A fun spin on traditional metal products in new construction, wrought iron stair railing offers both enhanced value and a striking impact on interior design. This feature project is a perfect illustration of a luxury stair. Both eye-catching and welcoming, this wrought iron railing conveys sophisticated style and charm. Our team partners with architects, builders, and general contractors to bring their visions to life, from inspiration to installation. In this unique custom stairs design project, our expert team worked to match the architectural design of the home and the unique style of the customer. Drawn with explicit details to ensure a perfect fit for the style and space, the ornamental metal system was hand welded by our team of skilled craftsmen. The wrought iron railings, welded with gentle curves and seamless transitions between lines, creates a beautifully balanced architecture to set this home apart. Wrought iron is a truly versatile design material, and this particular wrought iron handrail system offers a light and airy feel with expressive characteristics. The vertical wrought iron baluster system features a geometrical design, complete with vertical parallel lines and horizontal rake structural support. Its alluring, clean arches complement the simple curved structure of this residential space. Completing the handrail system, the solid balustrade – composed of classic red oak in a rich finish – offers ultimate durability and safety. The custom starting wood newel posts are simple and sophisticated, and they provide a clean transition into the hand welded wrought iron system. Wrought Iron Stair Railing: How Do We Do It? Our team is proud to leverage extensive national capabilities to design and deliver the highest quality wrought iron handrail systems. When working with our creative design team, the options are limitless, and our industry-leading experts love the challenge of designing unique, innovative projects. Once the handrail system design is complete and all drawings are approved by the customer, our ornamental metal team goes to work. Our skilled welders are true craftsmen, and they hand forge wrought iron within our state-of-the-art facility in Alpharetta, Georgia. The handrail system is then prefit to the stair to ensure a perfect fit and prevent messy welding at the job site. 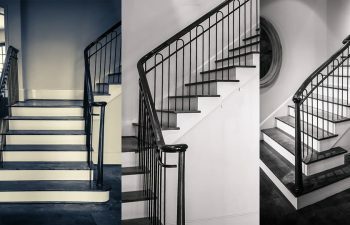 Whether you are seeking a simple geometrical wrought iron stair railing or an elaborate system with scrolled panels, our team is committed to quality, timely delivery, and client satisfaction in every project. Visit our wrought iron stair railings product gallery for additional details and pictures on our exquisite projects. From inspiration to installation our team is committed to designing and building the highest quality custom staircases. Our reputation speaks for itself, and client satisfaction is our highest priority. Although this is just one example, there are limitless options for custom wrought iron handrail, each hand-forged by our artisan welders for superior quality. Contact us today to discuss your next wrought iron railings project.